C1105. ARTUR RODZINSKI Cond. 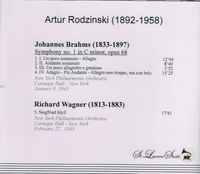 NYPO: Symphony in #1 c (Brahms), recorded 8 Jan, 1945; Siegfried - Idyll (Wagner), recorded 27 Feb., 1945. (Canada) St Laurent Studio YSL 78-104. Transfers by Yves St Laurent.